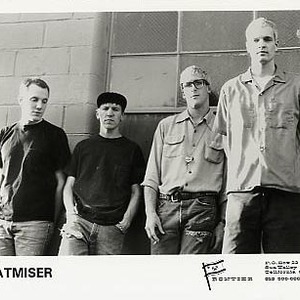 Heatmiser was an alternative rock band that originated in Portland, Oregon in 1992. Consisting of Elliott Smith (guitar and vocals), Neil Gust (guitar and vocals), Brandt Peterson (bass; later to be replaced by Sam Coomes, frontman of Quasi), and Tony Lash (drums), they were known for their well-crafted lyrics and songs featuring melancholic and cheery words and melodies. The pop-oriented songs of Elliott Smith were a contrast to the darker songs of Gust, while both Smith and Gust's songs touched on subjects such as anger, alienation, loneliness and despair. The band broke up in the fall of 1996 after Smith's solo work began gaining popularity. Gust went on to play in the band No. 2. Coomes carried on as half of Quasi, as well as playing as a guest musician for Built to Spill and Sleater-Kinney. Lash currently keeps himself busy as a producer. He helped with the production of Death Cab for Cutie's first two studio albums (Something About Airplanes and We Have the Facts and We're Voting Yes).